Baylor had the pleasure of contracting the stomach flu last week and then spreading it like wildfire to Peter and I and also various family members. Now a week later, a gallon of bleach and a washer that is tired of running 24 hours a day, I think it’s safe to say we’re done. It started last Monday night. B woke up around midnight and after a quick rock, she was back out. I chalked it up to a bad dream. Two hours later, she was back awake and it was then I realized she was awake because she had tossed her cookies all over her crib. I felt like a horrible mom for not realizing the first time she was awake, but I don’t turn on the light when I go in and check on her and she didn’t feel wet…anyway, put a check in the “bad mom” column. Peter and I spent the rest of the night rotating on the couch with her and a bucket. But by 7am, she was pale, but in good spirits. A day of the BRAT diet and it was like nothing happened so I assumed she had eaten something that didn’t agree with her or maybe a leaf from the backyard or something. So we had our play date with her cousin on Wednesday. And then I ended up in the ER that evening from the same virus. I broke my record of only having been in the hospital for my birth and then Baylie’s. Thankfully two bags of fluids, some pain meds and something to stop the vomiting and I was like new – or at least able to walk without being hunched over a bucket. I kind of remember Peter saying to the triage nurse “Listen, you couldn’t pay this woman to walk barefoot across a hospital floor let alone curl up in a ball and clutch your trash can on it”. It was ugly – but if I had to choose, I would so rather I have gotten the worse version than B. We’re very blessed that we have lots of family and all close and willing to help out so Bay went to Grandma’s house the next day and my sister came over in the afternoon after work to check in on me. While this was great for me, it turns out it was awful for our family. We single-handedly spread the nasty bug to my sister, my sister-in-law, her infant daughter and my mother in law. When Peter came down with it this weekend, we decided it was time to quarantine ourselves and break out the bleach. The picture above is every toy that Bay has touch in the last week that would survive a bleach bath. This is them drying after soaking. Anything that could go in the dish washer, clothes washer or sink of bleach did so. 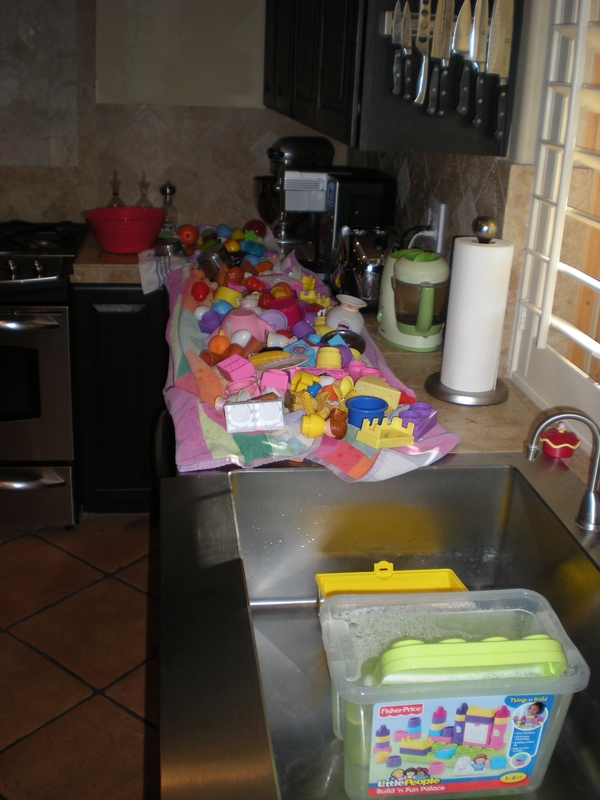 The few remaining, battery operated toys got a through cleaning with antiseptic and hot water. Baylie loves to clean so being given her own pack of alcohol wipes and free rein to wipe anything and everything was like heaven. By Saturday afternoon, our home no longer smelled like a frat house after a date dash but rather a school cafeteria after it had been swabbed with bleach post lunch. I may have burned out my sense of smell, but our house is clean, we’re all well and I won’t get any more calls from family letting me know that they too have contracted the virus from us. That said, I wrote several blogs last weekend that didn’t get posted. So if you’re reading one about gardening that refers to “last weekend” just know it was last last weekend. And wash your hands and stay away from anyone who even KNOWS someone who has the flu! Oh, I hate it for you. We just recovered from the bug last week. Hope your house stays barf-free!